As the world prepares for December’s crucial climate negotiations in Paris, attention has been focussed on whether the plans submitted to date are sufficient to meet the 2 degree target – a new paper published today by Ricardo Energy & Environment highlights the overlooked question of how to ensure that countries turn their plans into a low carbon, climate-resilient future. In the run up to the United Nations Conference on Climate Change (UNFCCC) 21st Conference of the Parties (COP21), more than 150 countries – representing more than 90% of global emissions – will have submitted ‘Intended Nationally Determined Contributions’ (INDCs), which comprise the targets, policies and actions that each country will contribute towards the collective goal of limiting dangerous climate impact. The adequacy of these commitments in restricting the worsening effects of climate change has been a contentious issue. However, after Paris the international community must move on from this debate and focus on implementing INDC actions and delivering what countries, and the planet, really want – achievement of their climate goals. 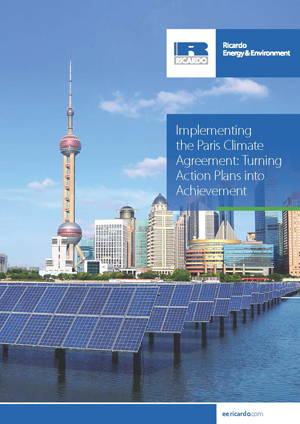 Implementing the Paris Climate Agreement: Turning Action Plans into Achievement, published today by Ricardo Energy & Environment, provides a clear framework for countries to follow in delivering their climate ambitions. The paper draws upon the consultancy’s experience supporting both developed and developing countries in the formulation and implementation of national climate policies. It highlights five essential and intrinsically linked pillars of INDC implementation that provide a pathway to a low carbon, climate resilient economy, alongside case studies demonstrating how countries are already leading the way in climate response.